Ah, summer! School is out, and sunshine is in! I’m a happy camper when the sun is up there in the sky! Vitamin D, perfect reading light, bright days of summer… What more could I ask for? Speaking of summer, what are your most memorable summer vacations? Growing up on a tropical resort island, I always find beach towns to be some of the most relaxing places in the world. This was why I chose to set my entire series of Savannah Sweethearts in Savannah, Georgia, that southern coastal town by the Savannah River, and on Tybee Island, that sunny beach town hugging the Atlantic Ocean. 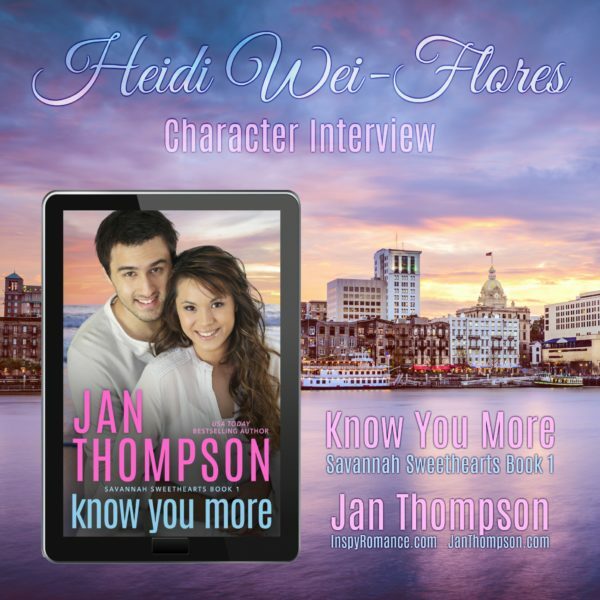 Savannah Sweethearts is bookended by a prequel, Ask You Later, where we get a glimpse of the background of my story world, but the series actually begins with Book 1, Know You More. The heart of Know You More is the first couple of Riverside Chapel: Pastor Diego Flores and Heidi Wei-Flores. Know You More chronicles their love story set against the early days of Riverside Chapel, a small church looking for a permanent home along the banks of the Savannah River. As their “biographer,” I tried to include as many details as possible in Know You More so that my readers can see where Diego and Heidi were coming from and where they were going. They were super busy people, as you can imagine, but somehow I managed to get myself invited for a late morning chat with Heidi at her beach home on Tybee Island. I might have promised to help walk her sister-in-law’s golden retriever that Heidi was dog-sitting. Hehe. I arrived midmorning at the pastor’s beach house — how that came about can be found in Tell You Soon (Savannah Sweethearts Book 2) — to find that Heidi had already walked the dog, thus saving me from having to do it at all. Our interview began on the boardwalk and ended in the sunroom. Me: Heidi, it has been several years now since you’ve moved back to Savannah. What made you decide to return here? Heidi: My brother Ming and I grew up by the Atlantic. We’ve been to Savannah frequently and know the area, so that’s one reason. Both of us were single at that time, and we both took the opportunities God provided for us. Ming opened his private investigation firm in town, and I went to graduate school. Riverside Chapel was in transition and we felt called to stay and help the church grow. It was a win-win for us. Me: Some of the readers of this interview might want to know how you met your husband. Heidi: If they read Know You More, they’ll find out that Diego and I have known each other since our college days. We kept in touch after he went to seminary and I went to graduate school. But we came back together in Savannah, and to this day, we haven’t left the city. Me: And you went to graduate school for years. Heidi: Yes, years and years. But you already knew that. (Laugh.) In fact, that was an issue between my brother and me for a while until I finally graduated with my second PhD. Me: Tell me what drew you to Pastor Flores in the first place. His heart for God and his heart for people. Diego is all about that and more. Me: You didn’t hesitate to answer that question. Heidi: I think Diego’s parents have taught all their children very well, and that heritage of desiring God’s will for his life is something I admire. I seek God’s will every day as I minister to the women at church. Me: There are many women at Riverside Chapel, for sure. I could go on writing Savannah Sweethearts endlessly. Heidi: Maybe you should. Eleven books only chronicle the lives of eleven couples at Riverside. I’m still waiting for Martin’s story to be told. And then there’s Officer Garcia, very single, though she’s happily unmarried at this time. Me: What are the challenges you have in your women’s ministry at Riverside Chapel? Heidi: As you know, God created every person with unique personalities, and with different skills and abilities. Since we’re a small church, it seems that we all know one another. When you’re friends with everyone, it’s both easy and hard to minister to them. Easy because I know my friends quite well. For example, I know what irritate my sisters in Christ or what would make them happy, since we hang out a lot together. Abilene, Tamsyn, Sophie are all my dinner buddies. We usually meet at Piper’s Place for dinner once a week or whenever we can. We also do women’s Bible studies together. However, it’s also hard because I can’t always be objective when I feel their pain and see their suffering moments, especially if they mirror mine. For example, ministering to Tina about her family caused me to remember my own grief of losing my parents. Me: Well, it’s almost lunch time. Thank you for taking your time out to talk to me. Since I didn’t get to walk the dog this morning, how about if I take you to lunch? Piper’s Place, of course. Heidi: That sounds wonderful. Piper will be glad to see us. She knows everyone at Riverside because we almost always adjourn there every Sunday for lunch after church. I can’t wait to read her story. She’ll be in a book, won’t she? Me: Yes, of course! Piper will be in Call You Home (Savannah Sweethearts Book 10). Please wait for it. Thank you for your time, Heidi! Heidi: You’re most welcome. May God bless you and your readers! Well, there you have it, dear readers. A little interview with Heidi, the first lady of Riverside Chapel. 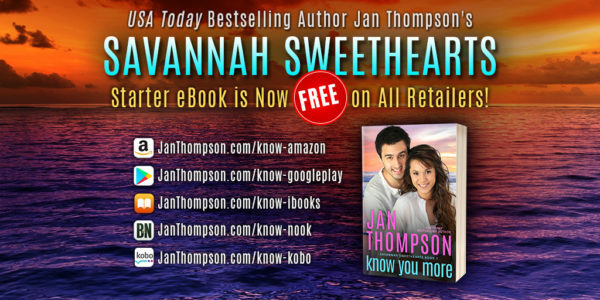 I hope you will check out my Savannah Sweethearts series and the two spinoff collections: Vacation Sweethearts and Protector Sweethearts. Tasmania sounds fun! Australia is on my bucket list. Anywhere with beaches for me too! Thank you for your comments. Have a wonderful summer! Hi Jan! As a child, our family being first generation German immigrants we took few vacations, only weekend visits to friends in Chicago, Milwaukee or Detroit. Most of my life I have lived in SW Michigan within 5 mile of beautiful sandy pristine beaches of Lake Michigan. As a teen, every summer our church youth group camped for a weekend at Ludington State Park. Personally I am not fond of camping. The first and only extended family vacation was in 1968 to Niagara Falls and to visit my aunt in Toronto. In my 45 years of marriage, I have traveled coast to coast – California, Florida, the Smoky Mountains, Mount Rushmore, Washington DC (26 states in all) as well as 9 foreign countries on three continents. Lots of memorable vacations and now it is fun to watch our oldest son take his family on some of these same trips. In 2012 we traveled with our oldest son and his two sons to Florida. Looking forward to reading Know Me More. Best wishes. Wow! You’ve been to places! I hope some day my family and I could visit all 50 states plus see more of the world. Hope you enjoy reading Know You More! Stay tuned for Book 7, which I hope to publish before the year is over! I was born in Berlin. I have relatives that live in Berlin and some that live south of Ulm. I visited Germany in 1984, 1996, 2002, and 2009. Visited Switzerland in 2007 and Japan in 2008. World traveler! That’s nice! I’ve only seen a little bit of Switzerland. I’ve never been to Berlin but it’s on my bucket list! Hi Jan, welcome to inspy. I love the setting. I used to live about 3 hours from Savannah, but for some reason we never went there. My most memorable summer vacay was over 20 years ago when we went to Galveston, TX. I’d never been to the ocean and I thoroughly loved it. We ate at a seafood restaurant on an old pier with sandy legs and feet, and wind-whipped hair. I found tons of shells and still have them. I collect shells and have a bunch other people have given me, but I keep my Galveston ones in a separate container. Galveston is on my bucket list too! I’ve heard wonderful things about that beach! Collecting shells is fun! I also collect some shells but not as many as I would have liked. Some of my shelf space is taken up by my son’s fossil and rock collections LOL! That’s pretty close to Savannah, where you used to live! I sometimes drive 3 hours round trip just in metro Atlanta alone. I do go back to Savannah & Tybee from time to time, not only for my books but also because I like the Georgia coast a lot! Savannah is one of my favorite places to visit, living just a couple hours from there we can make it a long day trip, or a quick weekend getaway! I love the squares and River Walk!! That’s cool that you can take day trips to Savannah and not have to pay for hotel! I’m in metro Atlanta so it takes me about 5 hours of driving each way to get to Savannah. Whenever I get a chance to go, I’m all for driving that much to get there in time for lunch LOL! I mention more of the actual town in Book 5 (Walk You There). I also describe the riverfront more in Book 3 (Draw You Near). I mention various parts of Savannah and Tybee in all 11 books. Eight down and three more to go! Our favorite vacations are to beaches. We enjoyed North Myrtle Beach, SC for many years. We went to Florida’s west coast twice and enjoyed that. We all love sun , sand and ocean! Me too re: sun & sand! I have a whole series of vacation romances in Vacation Sweethearts, and while I like mountain vacations, most of my settings are on the beach LOL. Thanks for the book. The story sounds interesting and I like that you chose to set this series on the coast.